Listening to people talk about the new movie version of F. Scott Fitzgerald's American literature classic, I feel like I may be the only person who has never read the book. I somehow managed to get through high school and college without ever once cracking open the pages of that novel. And on top of that, I've never seen the 1974 version starring Robert Redford and Mia Farrow, so I really am coming to the story cold. And perhaps for Baz Lurhmann's new epic extravaganza, I'm all the better for it. The story, for those who don't know, focuses on the elite of Long Island in the Roaring Twenties as seen through the eyes of Nick Carraway (Tobey Maguire). 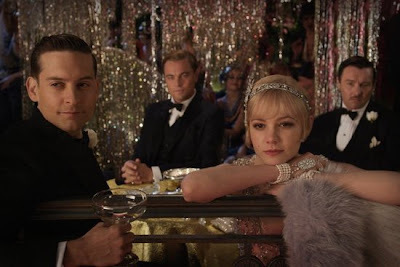 His cousin Daisy (Carey Mulligan) has married the wealthy Tom Buchanan (Joel Edgerton), but a mysterious man from her past, Jay Gatsby (Leonardo DiCaprio) has set his sights on her, trying – hoping – to woo her with his fabulous mansion directly across the river from her own mansion, or by throwing lavish, wild, booze and music-fueled parties. No one, however, seems to know the real Gatsby or if he even exists. That is until Nick gets an invitation to a Gatsby party … and no one is ever invited to a Gatsby party; they just show up. Nick befriends the enigmatic man and finds himself a go-between for Gatsby and Daisy. It seems that Gatsby met Daisy once when he was a penniless war veteran, but knowing that he could never live up to her expectations, he deserted her so that he could somehow make his fortune and prove his love to her. Unfortunately, her current marriage has gotten in the way of Gatsby's plans and it's only a matter of time before tragedy strikes and changes the course of everyone's lives. You're either going to love or hate Lurhmann's The Great Gatsby and I absolutely loved it. Lurhmann can certainly bring excess to the screen (see Moulin Rouge), and this seems to be precisely why so many mainstream critics hate the movie. I was mesmerized by Gatsby's over-the-top parties, complete with music not of the era, but somehow a Fergie song fits very well with the images on the screen. The cast is a mixed bag of performances. DiCaprio is fine even if he still has a baby face that belies his nearly forty years. His Gatsby is properly enigmatic, but perhaps the character is such a puzzle to begin with that not even DiCaprio can show us who the real person is. Mulligan is lovely and makes Daisy almost untouchable, and sometimes it's hard to see why Gatsby is so infatuated with her. It's hard to know if there's much substance beyond that pretty face, and if Gatsby is only "in love" with her to prove to himself that he is good enough for her. Maguire, unfortunately, is in a perpetual daze and his narration of the story sometimes sounds like he's simply reading a script (or directly from Fitzgerald's novel). Edgerton really is the film's star, bringing life to a character that, I'm told, is not very well fleshed out in the book, but in the movie he's always got an air of danger about him, making you wonder if when presented with the opportunity to go off with Gatsby she finds herself torn simply out of fear for what Tom might do to the both of them. I think it's Edgerton's performance that really makes the rest of the actors work harder and saves the film from being a bore with pretty visuals. Lurhmann has also chosen to shoot the film in 3D – to the chagrin of people who hate the process and don't understand why a story like this needs the process – and in his hands, he has proven what the process can bring to a film. This is no shoddy conversion. The film was shot on high definition digital video in native 3D, and if you watch closely you can see how Lurhmann has really composed the film for 3D. He uses the depth of field beginning from in front of the proscenium to as far as the eye can see, placing objects in front of actors while the massive sets or exteriors stretch far behind them. Lurhmann's 3D really envelops you in the story while only pulling out the gimmicky stuff – snow, rain, confetti – when necessary. It's very well-balanced and looks gorgeous. While watching the film, I kept thinking that this is how The Hobbit should have looked. Baz Lurhmann's The Great Gatsby may not be everyone's cup of tea, but I found the performances and the story to be engaging for the most part, the 3D an immersive experience, and the visuals to be absolutely stunning, making this film a true work of art.